The small intestine is a long tube that is approximately 18 feet long (6 meters). The small intestine is called small because the diameter or the width of the tube is much less than the large intestine. The parts of the small intestine include the duodenum, jejunum and the ileum. The duodenum is a segment of intestine between the stomach and the jejunum that is very active in digestion where many different enzymes mix from the stomach, liver, gallbladder and pancreas. 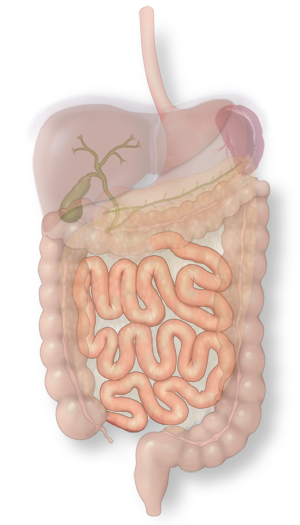 The small intestine is the location in the body where the majority of the nutrients from ingested food are absorbed. Whereas the stomach is responsible for the churning and mechanical breakdown of food, the small intestine is very important for absorption. Digested food passes through the wall of the intestine into the blood vessels which then distribute the nutrition first to the liver and then through the rest of the body. The jejunum is the second section of the small intestine; it is around 3 to 6 feet (average 1.5 meters) in length and lies between the duodenum and the ileum. There is no distinct demarcation between the jejunum to the ileum; however, the change from the duodenum to the jejunum is clearly marked because of the ligament of Treitz. The mucous membrane on the inner surface of the jejunum is covered with hair-like projections termed villi. These are instrumental in the absorption of nutrients such as proteins, carbohydrates, amino acid, sugar, fatty acid particles, vitamins, minerals, electrolytes and water. It is interesting to note that the villi in the jejunum are longer than those in the duodenum and the ileum. The surface are of the jejunum is also increased due to large circular folds called plicae circulares present in the submucosa. The ileum is the final part of the small intestine. It opens into the large intestine via the ileocecal valve. The ileum is preceded by the jejunum. This section of the small intestine is approximately 6 to 12 feet (3.5 meters) long. The ileum absorbs mainly vitamin B12, other water soluble vitamins, bile salts, and nutrients that were not absorbed in the jejunum. More specifically, the absorption of the vitamins takes place at the terminal ileum – the last part of the ileum. Removal of this portion of the ileum will necessitate supplementary vitamin B12 doses for rest of the life. The surface area of the ileum is very large to facilitate the adsorption and absorption process. The surface consists of many tiny finger-like segments that protrude outwards. These are termed villi and are covered with epithelial cells. Capillaries in the villi transport amino acids to the liver via the hepatic portal vein. The products of fat digestion, namely fatty acid and glycerol are absorbed by lacteals. These are small lymph vessels. The digested food is pushed along the ileum by means of peristaltic muscle contractions. The undigested food and water move into the colon. There is no marked point at which the jejunum ends and the ileum begins; however there are certain differences between the two regions of the intestinal tract. There is more fat within the transparent mesenteric membrane at the ileum as compared to the jejunum. Also, the ileum is of a paler shade and has a smaller bore.